Summer is officially here and plants are on our minds! Thanks to the miracle of chlorophyll, even during winter plants are fantastic at keeping our indoor air clean and fresh. They’re also great for supporting our mental health by reducing our stress levels. Unfortunately, many indoor horticulturists’ favorite plants are dangerous to the health of our four-legged family members. Lilies, asparagus ferns, and even aloe vera can be dangerous for curious pets and cause discomfort, illness, or even endanger their lives. Unless you keep your plants high out of reach and are careful about picking up any fallen leaves, it’s best to proactively protect your family by making sure the plants you do bring home won’t pose any risk. To help you out, we’ve compiled a list of 6 beautiful and commonly available plants that are perfect for improving your home while keeping your pets safe. Pink Jasmine (Jasminum polyanthum): This beautiful plant (pictured above) will bloom nearly all year long starting in February, filling your home with it’s wonderful scent and providing you with beautiful star-shaped white and pink blossoms. In the summer months it loves lots of indirect sunlight, and during the winter it doesn’t need as much, making it perfect for those Pacific Northwest grey days. During the summer the soil should be moist, though you can let it dry between waterings. Water it less through the fall, and let it be slightly dry in the winter and spring seasons. The blossoms require a humid atmosphere which isn’t too hard to achieve in the Portland area, but if you’re finding it’s dropping it’s blossoms too quickly you can set the pot on top of a pan filled with pebbles and add a small layer of water to the pebbles that will evaporate and add moisture to the air. Note that not all varieties of Jasmine plants can withstand living indoors. Some can grow up to 15’ tall and while that would definitely provide you with a huge wall of gorgeous flowers, it would probably be a little difficult to care for. Make sure that when purchasing a Jasmine plant you find one that can thrive in the indoors. It will also want to trail, so it’s best to set it up on a high shelf, put it in a hanging basket, or give it some scaffolding to climb. For more information about growing Pink Jasmine indoors, check out this blog post from Dave’s Garden. 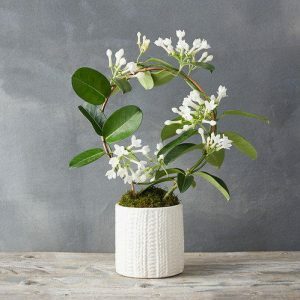 Madagascar Jasmine (Stephanotis floribunda): Despite being called “Madagascar Jasmine” this plant is not part of the Jasmine family. Unlike Jasmine which is native to China, Stephanotis floribunda is native to Madagascar. It too has beautiful star-shaped white flowers and smells wonderful, but you’ll find it’s leaves are larger and darker than that of Pink Jasmine. Madagascar Jasmine is a bit more sensitive than Pink Jasmine, but you’ll never have to worry about them when you leave for vacations (maybe to Madagascar!) because here at Hot Diggity! we’re always careful to follow all your household care notes. Madagascar Jasmine requires strong, but indirect sunlight. They need loamy soil that drains well but maintains moisture. Don’t worry about creating your own mix, just be sure to buy high quality potting soil when going plant shopping. They too need to have humid air, so also consider putting their pot on top of a rock plate with a small layer of water that can evaporate over the day for them. Misting with a spray bottle can also be effective. 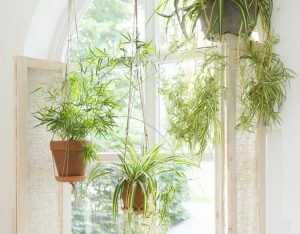 Spider plants are classic, easy to care for, and they sprout lots of new shoots so it’s easy to share them with your pet (or plant) loving friends! They grow well in low-light conditions so they can bring some color to our grey winter days without the need for a grow light. They need a fair amount of water and like to dry out between watering. They’re hearty so even if you’re notoriously bad at keeping houseplants alive (we get it) this is a great starter option! Spider plants can be grown in pots or hanging baskets, so keep in mind that their stems and grass-like leaves have a tendency to dangle. It might be a good idea to place them high up to avoid any cat-induced accidents – those little tufts can look a lot like feather toys to some – though this is more for the plant’s sake since they’re safe for any curious cat or dog. 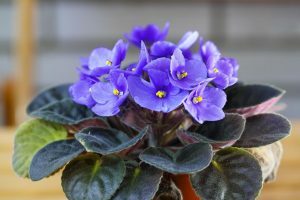 African violets can bring a beautiful pop of purple, pink, blue, or white to your home (depending on the variety). This generally low-maintenance plant can thrive without bright light and bloom throughout the year, though just like many cats we know, they do enjoy warmth and a sunny spot as much as possible. Added bonus – they also bring air purifying goodness to your indoor spaces! Thanks to Garfield, we know that ferns are not harmful to cats (and the ASPCA confirms that Boston ferns are safe for both cats and dogs). It’s like bringing a little bit of the beautiful Pacific Northwest forest indoors, and just like in their forest homes, they do well with high humidity and indirect light. 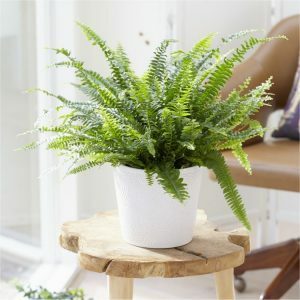 If you need to have the fern in a dryer environment (like when we’re all blasting the heat mid-January) you may want to mist it once or twice a week or set it in a tray of pebbles and water. Placing your fern in the bathroom where it naturally gets a steam bath is a great hands-off option! The Boston fern is one of the easiest to care for, but all true ferns such as the maidenhair are great for pet-friendly households. However, beware some so-called “ferns” such as the asparagus fern, which is in fact part of the lily family. There are many types of palms that are safe for the furry members of the household, including areca, bamboo, parlor, and ponytail palms, and they’re all relatively easy to care for as well! Despite the sunny beach association the name inspires, palms don’t need a lot of light and do well in just about any room in the house. The parlor palm (pictured) is a charming houseplant grows in clusters. 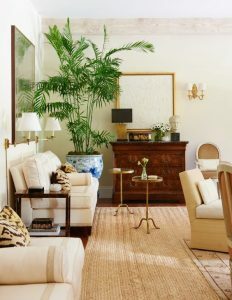 The areca is a more quintessential tree-like version that can grow to seven feet, while the ponytail palm grows to around three feet, and the bamboo palm really makes a statement at up to 12 feet tall and five feet wide. Keep the size in mind when selecting the location and the pot! Palms like their soil to dry out between waterings, so you will only need to water once a week (or less). Test the soil before you water and make sure they’re draining well and not sitting in water. Ponytail palms are in fact succulents so their trunks store water and only require minimal watering in the winter. The ponytail palm likes bright light, so in Oregon it could do well being outdoors in the summer and indoors in the colder months. Keep in mind that (like the “fern”) seeing “palm” in a plant’s common name isn’t a guarantee that it’s safe for pets. The sago palm, for example, is not true palm but rather a cycad and is toxic to pets. There are many options for pet-friendly indoor plants depending on your style and space and all of these listed are relatively easy to find at the local garden center or nursery. They range in size, color, and shape, and are fairly easy to care for in an indoor setting in the greater Pacific Northwest region so feel free to bring that green indoors! What makes in-home pet sitting different from boarding? What does having a professional pet sitter in your home mean? 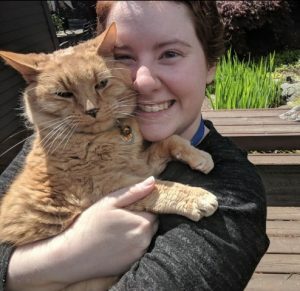 If you’re not sure about options for services when you’re out of town and can’t take pets with you or you’re concerned about having a “stranger” in your home while you’re gone, you’ve come to the right blog post! One of our most popular services at Hot Diggity! is Overnight In-Home Pet Sitting. 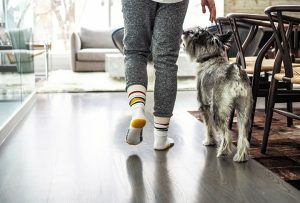 This is very different from boarding pets at a separate facility since you will have a dedicated sitter and your pets will get to stay in the comfort of their own home. A boarding facility is an unfamiliar environment to them where all the smells, sights, and sounds are different. Many boarding facilities can be loud and chaotic, causing anxiety for shy pets. Dogs that are reactive to other dogs really should not be in boarding facilities since they pose a risk to the other boarded dogs and therefore themselves as well. Their movement is often limited to just a kennel and personalized attention can cost extra. Another risk for both cats and dogs in boarding facilities is communicable diseases such as kennel cough. Conversely, if your pet is sick and could be contagious to others, they would pose a risk to those other pets. And let’s face it, we all prefer to stay in the place we are familiar with and that we share with the people we know and love. When those people have to leave for business trips or vacations, the next best option is in-home pet care so your pets can follow their normal daily routines while enjoying lots of snuggles from a dedicated sitter. Many Hot Diggity! sitters are capable of administering medicinal shots if a pet needs insulin injections or more. That kind of care doesn’t cost extra either. If that’s what your pet needs, it’s what we provide. 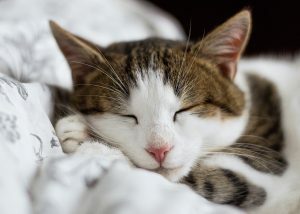 Our sitters spend the entire night in your homes (following your instructions on where to sleep etc.,) and keep to your pets’ normal routine in the morning. They have someone to snuggle with (if they’re allowed in bed) and as an added bonus, your house looks occupied while you’re away. We can also bring in the mail, water your plants, and take out the trash. Naturally, one of the greatest hesitations people have about using an in-home pet sitting service is security. At Hot Diggity! your pets’ health and happiness is our #1 priority and we thoroughly vet the background and integrity of our sitters. Unlike your friendly neighborhood kid, we are licensed, bonded, and insured pet sitters. Many of our sitters are Pet CPR certified, too. We take our responsibility to protect your home and pets very seriously and are always prepared in case of an emergency. We hope this post has answered some of your questions about what in-home pet sitting involves with Hot Diggity!, and if you want to know more or schedule a pet sit for your next trip (summer vacation, anyone?) send us a message or give us a call. We want to make your journeys as easy as possible so we offer a few additional options including a special Welcome Home Service where we pick up a few groceries for you so you can come home from a long vacation or business trip to fresh fruits and vegetables instead of an empty fridge. Traveling can be stressful enough as it is even without pets at home to worry about. That’s one of the many reasons why Hot Diggity! is always here with our Availability Guarantee to help you enjoy your trips with a relaxed sense of security. Put your mind at ease and give us a call! Do you love making snacks for other people? What about your pets? Thanks to the internet there are a ton of DIY Dog Treat recipes available. By making the treats yourself you can control the nutritional content and ensure that your dog’s snacks are free of any dietary restrictions they might have. Here are 3 recipes guaranteed to make your dog a happy dog! Just remember, snacks are no real alternative to their normal healthy diet and should only be provided in moderation in order to ensure that your pups stay healthy and fit. Leftovers Trail Mix Supreme: Combine any of the following leftovers from your refrigerator to create a flavorful trail mix that you can bring along on a hike with your dog, or to feed your dog as a snack after a trip to the dog park. Place in a food dehydrator or an oven set to 200°F until dried. Homemade Pumpkin Biscuits: Use cute dog treat shaped cookie cutters to make your own special doggie biscuits at home! Make sure to use only unsalted and xylitol-free peanut butter when making this recipe. Xylitol is poisonous to dogs and too much sodium is bad for their cardiovascular health like it is with humans. Adam’s 100% Natural Creamy and Unsalted Peanut Butter is a great wholesome peanut butter brand that is safe for dogs. You can also substitute cooked sweet potatoes for the pumpkin too if you want! Combine pumpkin, peanut butter, eggs, and oil in a bowl. Add in some baking soda and oat flour, then stir until a stiff dough forms. Knead dough or mix until flour is incorporated. Roll out dough with a rolling pin and use a cookie cutter to cut out dog bone shapes, or just bake into whatever shape you like. Bake for 15 minutes. Heat up the coconut oil and mix with the peanut butter until very smooth. Drizzle over the treats and cool till glaze hardens (it does best in the fridge or freezer). Doggie Delight Frozen Treats: It might seem like a dream right now coming out of winter, but the hot summer days will be upon us soon and that means you’re going to need creative ways to help your best bud beat the heat! Here’s an easy way to make fun treats that will help keep them cool in the sun. We don’t recommend freezing treats inside Kong or other hollow toys however, the ice can be too strong and suction your dog’s tongue into the toy, causing severe and life-threatening damage if it’s not caught in time. Instead just freeze these treats in ice cube trays or popsicle molds! We promise they’ll be fun enough for your dog as is. Have you made any of these for your pups? Did you do anything different? How did they like them? We’re always happy to hear from you! Living in the Portland metro area, dogs that love playing outside are usually limited to backyards or fenced-in parks. While the off-leash parks in Portland and the suburbs are usually pretty great, Portland has one huge secret paradise for dogs that is absolutely incredible; the Sandy River Delta Park. Sandy River Delta Park is open year-round and is the doggie equivalent to Disney World. It’s a massive, thousand-acre park where dogs are allowed to roam free (except for the parking lot and the Confluence Trail), and us humans can get in a lovely, easy, walk. People also bring their horses here, so if you’ve ever wanted to let Buster see a horse in real life there’s a pretty good chance of that here! The park encompasses a large forest section, grassland area and, of course, the Sandy River section. It is seldom busy (even on summer weekends) and there is always plenty of parking available. 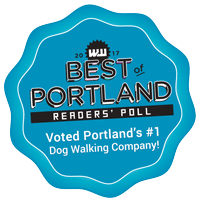 If you’re considering taking your dog to a beach, Sandy River is a wonderful alternative to ocean beach. It’s safer, has shaded areas, and tends to have fewer small children present. The water is also shallow and lazy, making it fairly easy to grab toys that drop in on accident. Later in the summer there are ample blackberries to pick–who loves pie?! Aside from foxtail seeds and the extremely rare sea lion, this is a very safe place to go spend a warm summer day. Note of Caution: Dogs must be on-leash on the Confluence Trail–there’s a $100 fine if you are caught without your dog on a leash. 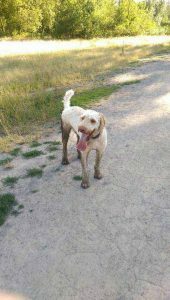 If you’re looking for an off-leash friendly option, try the The Meadow Trail. Bring something to carry your full doggie bags with you, trashcans are few and far between and often overflowing. Bring a towel to wipe off sand or mud (for the car)–double use as a place to sit on the riverbank. Bug repellant is especially helpful in late Summer/Fall. In warmer months remember to wear sunscreen and put a little sunscreen on your dog’s nose too! When grasses are going to seed bring something to cover your dog’s nose and ears so that they don’t breathe in the harmful seeds called foxtails. These can get lodged in a dog’s lungs, nose, or ears and later require vet attention. The OutFox Field Guard is the best solution I’ve seen so far, but any other product or DIY suggestions are welcome! If you do head out to the Sandy River Delta Park, send some pictures. If you have other favorite parks in the area, we’d love to hear about them too!